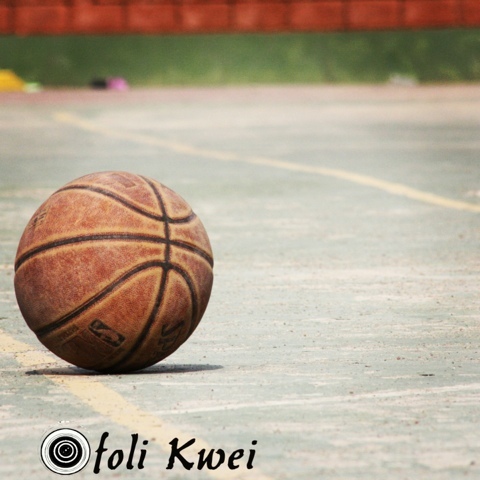 I took this photo of the basketball lying on the court unattended to last Wednesday (2nd Jan.). It was during the DC Dynamics U16 invitational tourney at what has become known as the Central Courts at the HQ of the ICGC at Abossey Okai to us regulars. It's the first photo I've applied a personal watermark to. After spending some time working on it, something about it struck me and I must confess I'm not very sure if I have full grasp of the thought myself. If you're like me and spend a lot of time watching, reading and following basketball, you definitely have heard countless times coaches yell out to their teams(especially youth teams), "protect the ball". In fact, the entire game is about "protecting" the ball. Think about this, for a moment this rock is left alone. This rock that everybody goes chasing when the game is on. Would really like to know your thoughts about this. Like I said, I don't even really know why I'm thinking about this situation myself. Last year at Blogging Ghana's #BlogCamp12, @kajsha defined a blog as "your home on the Internet". If that be the case, I've not done justice to this home of mine. I think I've been too selective in what I blog about. This year, I'm going all out. More photos(obviously the reason for the watermark), more articles about anything and everything considering the wide range of things needed to make a home a home. From food, to clothes, to places, to sports, to politics, work, business, the world, photography, film, ...anything and most of all as much as I can, Ghana!